Are your kids self-motivated to learn? Give positive and specific feedback. Scootpad helps you to clearly identify your kid’s areas of strength and improvement. Be present and engaged in what your children are learning. Ask your children to talk about what they are learning in school and what interests them. 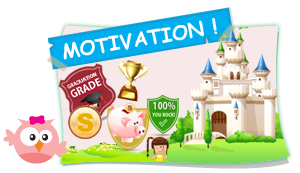 Using Scootpad, parents can collaborate with their kids and set goals and rewards (achievements). By having clear rewards in mind, kids are motivated to work towards their goals. The best way to motivate kids is to keep them interested in what they are doing. Scootpad’s curriculum is engaging and fun, which keeps kids coming back for more. Our goal is to foster intrinsic motivation by helping kids feel successful and interested in math and reading.